FDA cleared hair loss treatment for men and women suffering from genetic hair loss (Androgenic Alopecia) and thinning hair, Laser Hair Loss Treatment Therapy is the most up to date surgical scientific approach to treating hair loss, thinning hair, baldness and problems associated with the scalp. Laser Hair Rejuvenation is a tested, proven method using low level laser energy, or “soft” laser light to effectively treat the quality of hair loss in both men and women. Low Level Laser Hair Therapy (LLHT) has been shown to stop the progression of hair loss in 93% of clinical patients, as well as promoting the appearance of thicker, stronger and healthier looking hair. Laser Hair Therapy utilizes an instrument containing therapeutic low level lasers founded in Europe. The treatment delivers light energy directly from laser positions designed to cosmetically treat the appearance of thin, fine, damaged hair. Physicians have shown broad acceptance of this technology as an effective treatment for both men and women suffering the devastating effects f hair loss. With laser hair therapy, you can achieve thicker, fuller, shinier, and healthier looking hair. Increases blood supply to the scalp by 54% after initial treatment. 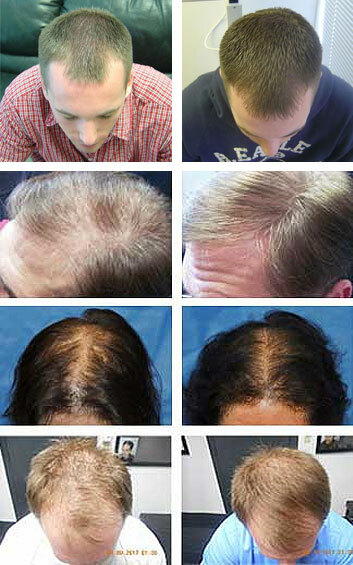 Stops the progression of hair loss is 85% of patients. For post-operative transplant surgery, laser treatments have been shown to help newly transplanted hair to thrive and enhances the healing process. Tosi Hair Replacement Clinic Laser Hair Loss Treatment programs are affordable and effective for men and women of all hair types and ethnicities. What is Low Level Laser Light? Low level laser light is compressed light of a wavelength from the cold, red part of the spectrum of electromagnetic radiation. It is different from natural light in that it is one precise color; it is coherent (it travels in a straight line), monochromatic (a single wavelength) and columnated (it concentrates its beam in a defined location or spot). These properties allow laser light to penetrate with no heating effect, no discomfort and no known side effects. The unique laser light penetrates into the scalp tissue where it stimulates the micro-circulation and improves cellular metabolism and protein synthesis. How Soon Will I See Results? Each patient responds differently depending on the severity and type of hair loss, however the average person will start to notice a change in the appearance of their hair in as little as 24 to 36 treatments. Tosi Hair Replacement Clinic’s staff is dedicated to delivering an unparalleled level of care and focus on your individual hair loss concerns, comfort, and privacy. We invite you to CONTACT US TODAY and discover how easy it is to restore your hair, and restore your life.